This meeting is supported by the Higgs Centre, the EPSRC Network on Emergence and Physics Far From Equilibrium (EMNEQ) and Physics of Life. 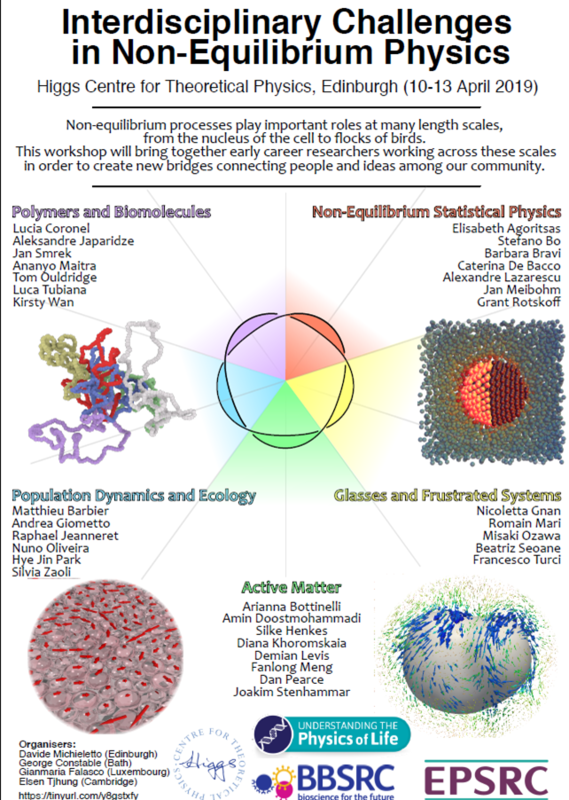 This meeting should be of broad interest to early career researchers working across scales in physics and biology. Please complete the registration in order to insure your place for the Workshop. Please note that there is a registration fee of £10, contributing to the cost of lunch and refreshments during the breaks. Accommodation for this event should be arranged separately. Please note, there are limited spaces available for this event. Registration will close as soon as capacity has been reached. For any enquiries relating to this event, please email: k.h.baker@dur.ac.uk. The meeting will take place at the University of Edinburgh in the James Clerk Maxwell Building, Kings Buildings. 15 minutes by bus from Edinburgh city centre. Details on getting from the City Centre to JCMB here. A map of the Kings Buildings campus here. Edinburgh is well served by trains and planes.